Is your canoe helmet fitted correctly? 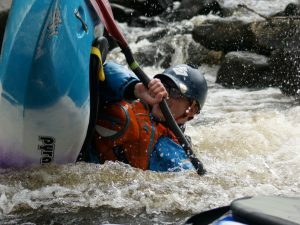 We all know that wearing a helmet is essential in white water and many other paddling environments. But if it doesn’t fit correctly, it can be less effective than it should be leaving you exposed to potential injury. There are many different helmets out there. Which you buy and use is a combination of personal preference and which adjusts to fit your head best, as well as your budget. However, no matter what helmet you choose or if you are wearing a club helmet it need to fit correctly This means that it should cover your forehead, and not move around, as well as being comfortable. If your helmet can move around on your head, the chance are that if you capsize the flow of water will move it. For example water can push your helmet back on your head, leaving your forehead exposed and open to a potential head injury. Kayaking helmets either have an adjustable head cradle that allows you to get a good fit, come with various bits of foam padding to fit it too your head, or often combination of the two. So make sure you know how to fit whichever helmet you use. Also ensuring your chin strap and straps by your ears are properly adjusted to help keep the helmet where it should be. If you have (or get) your own helmet make sure you read and follow the instructions to get a correct fit. Some manufacturers also have YouTube videos to help you with fitting. If you are buying a helmet try various models to find the best fit and get advise in the shop about fitting. So check please your helmet fits (and recheck it regularly). And if you need advice ask one of our coaches.